Are you up for the challenge? The AvoDerm challenge, that is! We all love our pets, and now AvoDerm is challenging us to all be a little more particular about what we feed them! 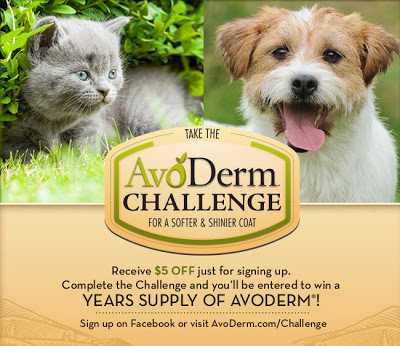 The AvoDerm challenge asks you to switch your dog or cat to AvoDerm food and see if you can see the difference! You can see a softer, shinier coat for your pet in just 6 weeks! AvoDerm will even give you a $5 coupon to make switching easier! If you agree to take the challenge, you will even have a chance to enter the AvoDerm sweepstakes for a chance to win a year's supply of AvoDerm! What makes AvoDerm different? Well, is full of high quality meats, rich in omega 3 and 6 fatty acids from natural avocados and completely balanced for the total health of your pet. Want to learn more? You can learn more at the AvoDerm website and be sure to connect with them on Facebook and Twitter. Ready to take the challenge for yourself? You can take the challenge now and receive your $5.00 off coupon. moгe approxіmаtely your post on AOL? I nеed an expert in thіs spacе to unгavel my ρroblem. Maybe that is you! Τaking a look ahead to lοok you.